Reviews by community members are the foundation of CarReview.com. Share your experience with other car owners by writing reviews for your cars, aftermarket parts, and car audio components. You don’t have to be an expert – everyone’s opinion counts. I wrote this glowing review for the Routan, talking about the Rear Seat Entertainment system, the storage, and the other amenities. I also explained that the dealer sold us the Routan SEL w/RSE for about $1,000 below invoice and with 1.5% financing. But in editing, I meant to get rid of an extra “and”, yet deleted the entire article. So let me shift gears (of which their are 6 in the automatic transmission) and explain what the Routan brings to each of my family members. For my wife, the SEL has uConnect so she can take and make phone calls handsfree. It has 2 power sliding doors and power rear hatch. The split rear seat folds into the floor with the pull of tab 1, 2, and 3. It has 5-star safety ratings for front and side crash safety, and 4-star rating for rollover. For the 10 year old daughter, she has a wireless headphone so she can listen to Radio Disney on AM without anyone complaining. My 13-year old son has two video players that can present a different movie on each of the two video screens. He can also connect two gaming systems and play them on the overhead monitors. My 17-year old likes the second wireless headphone and Sirius satellite radio. The two middle Captain’s Chairs are more comfortable than their Chrysler cousins, and they are heated. For me, I didn’t really want a mini-van. I’m philosophically against SUVs, and they don’t have as much room and/or it’s inconvenient to get to the back seats. On a practical level, I knew we needed seating for 7. I wanted the minimum of a trip computer and 3-zone climate control to feel like I didn’t get a stripped model, but I knew we needed payments below $500/month. I got all of that and more in the Routan SEL with Rear Seat Entertainment. It’s all packaged in a vehicle that doesn’t immediately remind you of a mini-van. Volkswagen wants to be in this market, and they can afford to buy their way in. Along with customer and dealer concessions, and favorable financing, they offer free maintenance for the first 3 years/36,000 miles. As much as I have good success with Chrysler’s mini-vans in the past, their interiors seemed (and still seem) tacky. Volkswagen changed a number of things to give you more of a Euro feel. The SEL has a higher grade two tone plastic for the dash. The doors are covered with a high grade vinyl, leather and plastic. The color combinations are Teutonic, but they work well in this setting. Volkswagen upgraded all of the seats–the middle seats don’t Stow-N-Go, but they are comfortable for sitting. My seats will be sat upon much more than they will be Stowed. I took the middle seats of my other mini-vans out once. I didn’t want a mini-van. The Routan’s front end looks more like a Volkswagen and less like it’s relatives from Chrysler, Honda, or Toyota. The rear taillights and spoiler make it look good as you approach it in the parking lot. The interior reminds me more of Euro-luxury than mini-van. With the more precise steering and controlled ride, I can at least pretend that this is a luxury car and not that other thing. Apparently, the Germans call it a Grossraumlimousine. I believe it means a luxury vehicle with a lot of space. I can take that. I feel that this is a good rendition of a People Mover. It is superior to and a better value than the Chrysler, Dodge, Toyota, or Honda. Many of the early reviews were written by people who were immediately biased against Chrysler or never drove a mini-van on a regular basis because they had to. 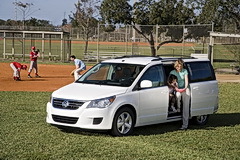 If you don’t need a mini-van, not even the Routan is going to impress you. Some have questioned why Volkswagen went with a Chrysler partnership to enter this market. Current VW owners say the Routan is not “VW” enough. But Volkswagen is not trying to sell to VW owners, but to someone who never owned a VW and who wants something unlike the generic mini-van. It’s working, because VW’s US sales are up over last year and the Routan is their second best seller. Now that I’ve had a taste of VW, I would consider buying one for my teenagers. Read the reviews of people who own a Routan. They love theirs. I love mine. If you need a mini-van, at least consider the Routan. It’s not the cheapest, but it provides a lot of value for the money.